I always love going home to south Louisiana. Living in New England can’t bring me close to the drapery of the Spanish moss on the two hundred year old oak trees, the Zydeco music, the festivals, or the passion for fresh, Gulf seafood. People travel from all over the world to my home state to experience what I grew up with. SHUCKS! The Louisiana Seafood House! in Abbeville used to be a small, little restaurant along the Vermilion River, but has since moved a little further up the road. Doesn’t seem to have affected it’s traffic one bit - we were one of the first patrons in the restaurant and by the time we left, there was a good sized waiting list for a table. My dad and I had stopped in Maurice, population less than 1000 and still by definition a village, to buy a turducken, which I packed in a soft-sided cooler and brought back to Boston with me, and which then made it’s way on to Montreal, Canada for Christmas dinner. Since Abbeville is not much further down the highway, we decided to have dinner at the former riverfront restaurant. We had the sweetest waitress waiting on us. With every pass or stop at our table, she would call my 85 year old dad “honey,” “sugar,” “baby.” I asked her recommendation for an entree, and with a huge grin, she suggested the “Sassy Shrimp.” The name alone was enough to tempt me. It was on the menu as an appetizer, with a hint of what to expect: “Sassy because initially sweet, then it talks back.” My kinda of south Louisiana seafood eatin’! Our waitress said she could make a special order of Sassy Shrimp as an entree. In great description, and with the conviction of a true local, she rolled out words like “fresh Gulf shrimp,” “smooth on the first bite, then it has a real spyyy-ceee bite! Umph!” All with the head shake for emphasis. 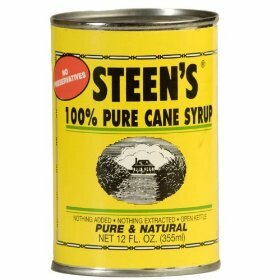 “It’s made with that Steen’s Cane Syrup, you know, Steen’s” - SOLD! Before she even finished telling me, I jumped in - I was on it! Yum-yum! 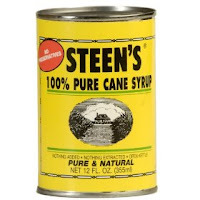 I love Steen’s Cane Syrup, and anything that has it, I want it. Steen’s has been produced in Abbeville since 1910. Pure, 100% cane syrup, made right from the sugar cane fields surrounding the town, and in December, in the final stages of sugar cane harvesting and producing season. I started with a bowl of duck and andouille gumbo, the perfect compliment to my Sassy Shrimp. When my Sassy Shrimp arrived, forget what was on the rest of the plate - it was all about the Sassy Shrimp. Each of the 6 butterflied shrimp had a deep golden, caramel glaze on it, perfectly seasoned with the Steen’s cane syrup, pepper and spices. There was a good “kick” to each bite, just like promised, but washed down with a cold beer, it was true harmony. I was missing home more and more with each forkful. Sassy Shrimp is just that - sassy! 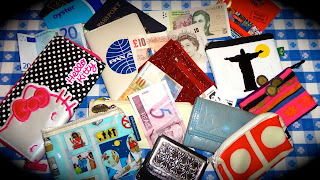 Whenever I travel to a new city that has a defined currency, different from any I have used previously, I look for a wallet there to use just for that specific currency, something that reflects the culture, the uniqueness of the city, or the country. I don’t use plastic ziploc bags that can rip when too many coins weigh it down, and no mixing it in with my US money and having to stand at the cashier’s desk fishing out each coin, one from the other. When I leave on a trip, I go to my box of wallets, grab the one I need, and check to see how much currency is left over from my last trip to get me started on my next one. I grab my wallet, toss it in my bag, and it’s a go. My euro wallet has a perfect slip of a pouch on the backside to keep my Paris Metro tickets. My British wallet is just large enough to store my Boots Pharmacy rewards card and Oyster Tube card. The pink fabric wallet I keep my Mexican pesos in I bought at a farmer’s market on a layover in Guatemala. Currently, I’m up to ten different wallets, including my US wallet. Some I already had: a Brighton black leather and silver wallet I was given as a gift almost 20 years ago - perfect for Argentine pesos; a red and white plastic wallet that I bought at a store in the local mall to put Q-tips in - perfect for Canada (or Switzerland, or even Japan); a wallet with diagrams exaggerating particular airline situations overly hilarious to airline crew members - exactly right for British pounds, and cheeky British humor. Others I have found along the way. A luggage store was having a close-out sale and I found the perfect wallet for Zurich, Switzerland - light cream colored, slim in dimension, perfectly lined slots for credit cards - the color and business-like presentation look of the wallet reminded me of the Swiss mountains and Swiss precision. On my first trip to Rio de Janerio, Brazil, I was captivated by the natural beauty of this tropical paradise, which is staggering, and breathtaking. All of it is blessed by Christo Redeemo, high above the city, looking down with outstretched arms, his presence felt everywhere. Rio is a religious city, devoted to its faith and beliefs, and for a city of this size, suffering with object misery and poverty, as well as wealth beyond normal scope, the city offers itself up to still being discovered, and experienced. My wallet needed to reflect this, and I found it. White for hope, with black trim for those who suffer in poverty, with Christo Redeemo figured prominently, with the sun above shining rays of light to lift all. So Rio. Japan, on the other hand, at least before the Great East Japan Earthquake and tsunami, on March 11, 2011, was a traditional rice wallet I bought on my first Tokyo trip, laying over in Narita, near the airport. Japan is two faces: traditional, and childlike. My rice wallet is slim, perfect, red like the sun in their national flag, with a Geisha on the front with tilted head and on bended knee. Traditional. Perfect. But, Japan is so much more, and has so much life, and life to still celebrate as their country struggles to stand again strong after so much loss and devastation. I bought a new wallet, with a jump-out-at-you Hello Kitty face, front and center. It is a fun wallet, pink and black, with polka dots; a childish wallet. It makes me smile, like a Japanese school girl in her so-regulation uniform, every time I use it. On 17 August, 2011, my crew and I went to a fireworks show, ending a day of celebration of the summer kimono, and there was Hello Kitty, high in the night sky, outlined in colored fireworks. Hello Kitty, and the colored hearts fireworks garnered the loudest “ooohs” and cheers of the night. I have 10 wallets now for all the different currencies I need - so far. I am just really relieved Europe went to a single currency! 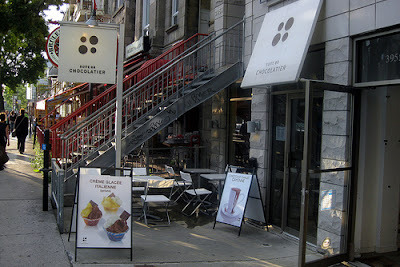 When I first visited Suite 88 Chocolatier in the Plateau Mont Royal, it was because I had read a small blip in a magazine about this new chocolate store that served hot chocolate with chili peppers. Sounded exactly like the way the Aztecs used to drink their chocolate over 2500 years ago. In a city as cold as Montreal in the winter, the joy of drinking made-from-scratch hot cocoa, and my love of these peppers in anything, this seemed a match made in cocoa heaven. The store is modern and sleek, all white and glass cases with artfully displayed, perfectly designed chocolate squares. This gave me my first, and only, pause, sensing that maybe this new chocolate store was possibly overrated as it evoked a “cool” vibe of sleek and modern, but might be the show pony that shows, but can’t perform. I took a seat at one of the small, red leather chairs, and ordered the chili hot chocolate. I mentally prepared my senses for what I hoped would be an experience an Aztec would appreciate, and was asked by the personnel, “Have you tried this hot chocolate before?” “No...” “Do you like spicy?” “Yes!” “Well, enjoy, but if this is too spicy, we will be happy to make another hot chocolate for you in another flavor.” No, I think spicy and I will be fine. 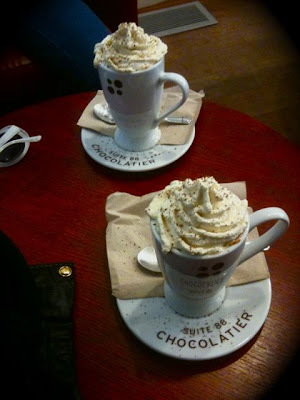 The chili hot chocolate came in a generous sized mug, and was thick, and dense, like a shelf supporting the whipped cream that was plopped on top. I could smell the chili peppers, mixed with the chocolate, and instantly was warmed. My first sip, expectations at the forefront, and wow! What a pow of spicy! Absolutely divine, delicious...decadent. Now, no matter the season, oh, it’s 94 degrees today in Montreal?, I hadn’t noticed, I am enjoying a steaming mug of chili hot chocolate. And not even breaking a sweat. City-Pharma - Paris’ Best Place for the Beauty Goods! My niece Margaret worked for InStyle magazine in New York City, then a major fashion house, and is now currently working for a very well-known make-up artist who has worked on almost every celebrity US magazine can photograph. Margaret and the make-up artist just completed a tour of the European fashion shows, Margaret backstage at all of them. Another niece of mine, Alanna, who turned 14 years old this summer, was on her way to discover Paris for the very first time this June, with her mom. Margaret wrote on Alanna’s Facebook wall to be sure to stop at the large Monoprix stores (I like the Monoprix on the Champs-Élysées and on rue de Rennes) and shop for cosmetics, and fun make-up. Great tip! I love the large Monoprix stores for exactly this reason. The Monoprix have downright awesome French product lines for make-up and cosmetics. One of my favorite purchases is the Christian Lenart “Eau de Bluets” for the eyes. In the summer, I put this in the refrigerator, and when I return home from a trip, I soak 2 cotton pads and put the pads on my closed eyes. Definition of a relaxing moment. However, when I want to buy loads of cosmetics and body products, and am feeling very, hmmm, je ne sais quoi, very Parisian, there is only one place to go in Paris: City-Pharma. If you can squeeze your way in, then get everything you need and want because you might not return immediately for any forgotten item on your list. Then again, who needs a list? Just start shopping! Hands down, City-Pharma has the lowest prices you will find anywhere in Paris on cosmetic items, even less than the prices at the Monoprix. 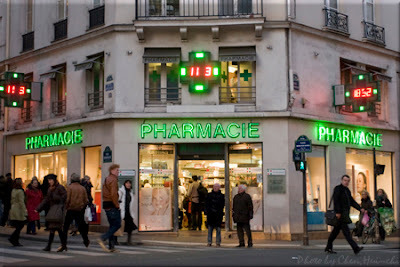 The store is located on a corner, on rue du Four, in St.-Germain-des-Pres, and you would miss it if not looking for it as it looks like any other pharmacy with a neon green cross lit up outside its glass front door. However, the few steps leading to the glass doorway are steps to girl-cosmetic-all-in-her-element-shopping nirvana. The product selection in each brand is vast and, with the discounted prices, voilà! All of the grandes dames of Paris come here; they come with Euro’s, and lots of them. I watched, with bug eyes, one elegantly dressed Parisian grande dame lay €600 right on the counter without any hesitation. Women of all ages shop here, though. Everyone has a basket, brimming with multiple items; plan to bump into baskets, and to stand in long lines to pay. Every French line you can think of is here. I usually buy all of my face creams, hand lotions, body lotions, shampoos and more at City-Pharma. Whenever I fly a Paris trip, this is stop #1. On one trip, I asked the sales assistant, all Parisian perfect in her crisp white jacket and pants, and in my 1st-grade level French, what my 13 year old French step-daughter could use for a face lotion at night. The sales assistant stared at me with a blank stare for what seemed like an eternity, turned her head with the perfect whiff! only French natives can do, and said, “French women only use crème for the face, never lotion!” Oh! No need to go through my list of items I buy at City-Pharma; five minutes in this pharmacy and you will have your own long list of favorites. Just be sure you bring your credit card with the highest limit. 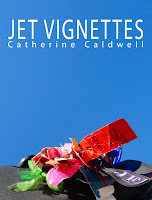 “Jet Vignettes” is a departure from the genre of books telling crazy crew and passenger drama tales; instead, it is the personal stories of an international flight attendant traveling around the world for the last 23 years: the laughter, discoveries, experiences, grief, love, downright frightening moments, crew camaraderie and multiple adventures. 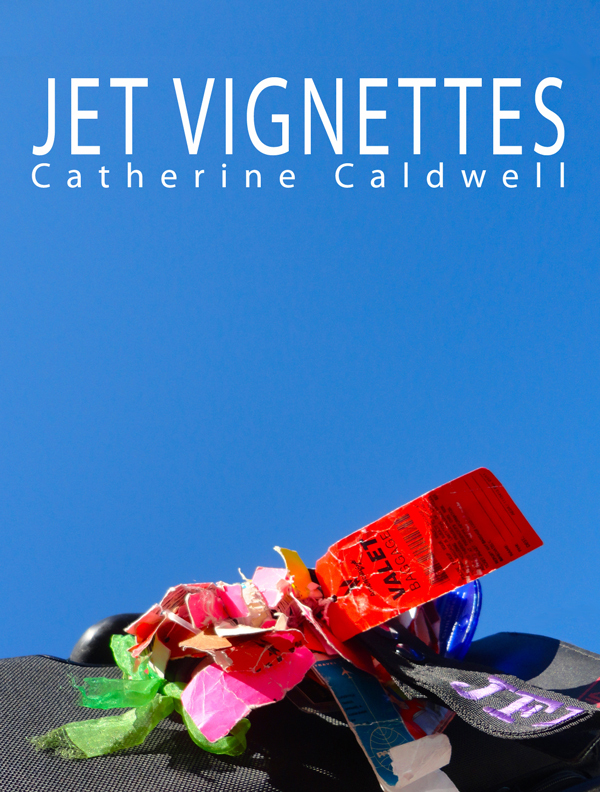 “Jet Vignettes is a well written, entertaining book. This book gives you the "inside scoop" of the airline industry from a very candid & funny point of view! A must read, for anyone wanting to join the airline biz! Catherine, also combines her love of travel, along w/ her family history, which makes it so personal!